We’d love your help. Let us know what’s wrong with this preview of Rags Hero Dog of WWI by Margot Theis Raven. To ask other readers questions about Rags Hero Dog of WWI, please sign up. This book is based on a true story and is one that will show your children some simple scenes of World War I and tug at your heart strings. Tissue is advised. This is the story of a mongrel dog who was surviving by his wits in Paris when he was found by an American soldier named James Donovan during an air raid after the Americans entered WWI. Private Donovan felt sorry for the hungry, scruffy, scared pup, giving him the very suitable name Rags. When the air raid was over, Donovan took Rags back to his army base, where he was ordered to pack up this gear so he could leave for the battlefield that night. And yes, Rags went with him. It didn't take long This is the story of a mongrel dog who was surviving by his wits in Paris when he was found by an American soldier named James Donovan during an air raid after the Americans entered WWI. It didn't take long for Rags to become a favorite with the soldiers and to adjust to infantry life in the trenches. He was immediately put to work, chasing mice and rats out of the trench where Donovan was fighting. Donovan was a radio operator and soon Rags was delivering important messages all up and down the trenches. It didn't take long for Rags to become quite the hero. In October 1918, little more than a month before the war ended, Donovan and Rags were both seriously injured in a terrible battle, but not before Rags got a message through that helps the Allies win the battle. At the army hospital, a kind doctor found Rags and took care of his injuries. From then on, Rags was blind in one eye, deaf in one ear and walked with a limp. Sadly, Donovan did not survive his injuries. Rags: Hero Dog of WWI is really a picture book for older readers, though there are not real resources at the back of the book. It is well written, but though the story is based on an actual dog, it is really historical fiction. Still, it is an inspiring work and is sure to please kids who like animal stories. By the same token, it introduces the reader to some of the horrors of war in a gentle, age appropriate way. The soft, muted realistic illustrations by Petra Brown are sure to tug at the heartstrings. I know they did mine. Rags; Is an extraordinary non-fiction book that tells the story of loyalty and friendship between a stray dog and soldier in the U.S. Army by the name of James Donovan. One night while patrolling the streets of Paris James Donovan literary stumbled upon the dog that would later be known as Rags. He brought the dog to his base where he quickly learned commands and became an unofficial military working dog. Rags cleared the trenches of rats, took messages to troops who were further away in the tre Rags; Is an extraordinary non-fiction book that tells the story of loyalty and friendship between a stray dog and soldier in the U.S. Army by the name of James Donovan. One night while patrolling the streets of Paris James Donovan literary stumbled upon the dog that would later be known as Rags. He brought the dog to his base where he quickly learned commands and became an unofficial military working dog. Rags cleared the trenches of rats, took messages to troops who were further away in the trenches and a morale boost to the soldiers. Unfortunately Private Donovan and his loyal companion were wounded in battle, Donovan is sent back to the United States, and rags is right along with him. The major themes in this book are loyalty and friendship shown by both rags and private Donovan, they not only went above and beyond the call of duty to the country but also for each other. Being in the military myself this book made me reminisce about my time overseas and a dog by the name of chocolate that we adopted; it did not matter how terrible the day was, he always greeted us with a smile and a tail wag upon returning to base. This quick read tells the true story of a little Parisian dog who is adopted by an American soldier during WWI. The dog bonds with the soldier and is allowed to stay as a mascot, carrying messages through the lines. I checked this out when my Grandson needed to read several nonfiction books about animals, and he enjoyed it. There is a death in the book, so be warned. (It's not the dog.) I thought the pictures were better than the story itself, which was really brief, so 2.5 stars. Be sure to read This quick read tells the true story of a little Parisian dog who is adopted by an American soldier during WWI. The dog bonds with the soldier and is allowed to stay as a mascot, carrying messages through the lines. Summary: Adventures, battles and ultimately legendary status, a little dog named Rag finds himself to be the best companion of an US army man, during WWI. This is the tailor of a loved and loyal dog who earns his status as a soldier. Personal Response: When children learn of war, they quickly catch on to its reality-death, injuries, and loneliness for many soldiers. This tale brings light to the battlefield as a soldier has a little dog to help them all. In an almost comical way, this is a story Summary: Adventures, battles and ultimately legendary status, a little dog named Rag finds himself to be the best companion of an US army man, during WWI. This is the tailor of a loved and loyal dog who earns his status as a soldier. I heard about Rags from an acquaintance and this was the only book I could find when I searched for the story. This childrens book tells Rag's story of heroism and the brief story of the man who found him. Rags, a mutt found on the street in Paris, ended up becoming attached to an Army division and he served his country well. The story is a bit emotional at the end but it's a good book and is wonderfully illustrated. Raven, M. T. (2014) Rags hero dog of WWI: A true story. Ann Arbor, Michigan: Sleeping Bear Press. This is a touching story about how a solider found a dog in the streets of a town he was deployed to and just had to take him home. Despite trying to keep him out of harms way, Rags just wanted to stay with his person. He soon become one of the soliders as well. This is the journey of Rags and his solider, up until the solider died and Rags has to find a new love and a new home. A wonderful picture book about an actual dog named Rags who was adopted by a WWI American soldier named Donovan. The dog worked to send messages back and forth to American troops until Donovan and Rags were injured in a shell arrack. Donovan dies but Rags lives in with a commander’s family and moves to the US. I chose this book for my class because of the 100th anniversary of Armistice Day. A nice story. A super cute story that informs readers about the heroic role our four-footed friends played in WWI. Although this is an illustrated kids book, I recommend it to readers of all ages, especially those who love dogs. I read it to my dog (he wasn't that interested in books...), and I also work with high schoolers who are super interested in these types of stories. Beautifully told and illustrated story of stray dog, Rags, who is adopted by US Army Private James Donovan in Paris during WW1. The pair are inseparable even on the battlefield. Rags, war hero, 1st Division Mascot WW1. Really a nice little book! Well done..... one can hardly beat that combination, history & a cute little dog! Very nice colored drawings/illustrations, & epilogue & 'tail end' at the end. Good for all ages! True story, but as it often happens with any canine centered plot, a sad ending. A true story of a remarkable little dog. Rags is a little mutt who became one of the first war dogs to help soldiers in WWI. He would run messages back and forth and helped save many lives. Rags: Hero Dog of WWI, written by Margot Theis Raven and illustrated by Petra Brown, is a nominee for the 2016-17 South Carolina Picture Book Award. Rags tells the true story of a small dog who made a big difference. Rags began his life as a mutt in the streets of Paris, but a chance encounter with an American soldier, Private James Donovan, during World War I changed this dog's life. Rags became a mascot of sorts for the Army's First Division, and he and Donovan became inseparable. 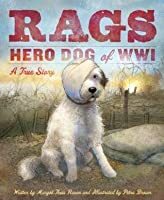 Rags assisted Rags: Hero Dog of WWI, written by Margot Theis Raven and illustrated by Petra Brown, is a nominee for the 2016-17 South Carolina Picture Book Award. Rags became a mascot of sorts for the Army's First Division, and he and Donovan became inseparable. Rags assisted Donovan on missions and saved many lives in the process. He was a true hero who remained loyal to his best friend through good times and bad. Rags is a dog who has never had anyone to love and take care of him- that is until a young soldier finds him and invites him into his life as a war dog. Rags quickly becomes famous for all he has done, and gives his life to aid the soldiers. This remarkable true story tells just how much love there is between a man and his dog and at what lengths Rags will go in order to save him. The illustrations in this particular book are very well thought out and done beautifully. The colors seem to have a w Rags is a dog who has never had anyone to love and take care of him- that is until a young soldier finds him and invites him into his life as a war dog. Rags quickly becomes famous for all he has done, and gives his life to aid the soldiers. This remarkable true story tells just how much love there is between a man and his dog and at what lengths Rags will go in order to save him. The illustrations in this particular book are very well thought out and done beautifully. The colors seem to have a watercolor look to them and match the text very well. Although the illustrations take up most of each page, they are never overbearing and too much to handle- instead they enhance the story and make it even better. The story and illustrations for this book are adorable! Brave little dog goes to war. The illustrations are adorable and the story intriguing! I felt, though, that the story would have better fitted a midgrade length chapter book. The picture book had two long pages of text at the end that were just as important to Rags' story, but were not illustrated (page restrictions because of format?). I wish the author/illustrator hadn't limited themselves so much OR simply made their work longer than the The story and illustrations for this book are adorable! Brave little dog goes to war. The illustrations are adorable and the story intriguing! A private in the US Army stumbles upon a little dog while he is stationed in Paris. The two soon become inseparable and Rags even accompanies him into battle. The illustrations are done digitally. This book would be useful in the classroom because it is about WWI, which is not as commonly written about, especially in children's books. It is also a great book for kids because it is about a dog and kids love dogs. Touching story about a stray dog found by a WWI soldier in Paris. Sergeant Donovan named the dog Rags. Rags proved to be a very useful companion. He was able to warn soldiers of incoming bombs by hitting the dirt before the men could he hear their approach. Rags got rid of mice and rats in the trenches enabling soldiers to have more relaxing nights. He also learned to salute! Must read Epilogue to find out what happens to Rags! I can't wait to show this to my animal-loving readers! They will fall in love with Rags, and perhaps learn a bit about World War I as well. Too few books about The War to End All Wars for youngsters, this will be a great addition. Realistic illustrations show the soft parts of the story and the hard parts of the war. Raven highlights the amazing work and loyalty exhibited by Rags during WWI. I've decided to put this in the higher level nonfiction area because Rags gets injured by a bomb (view spoiler)[and his caretaker dies (hide spoiler)]. The story is full of action and suspense which will keep an older audience's interest. 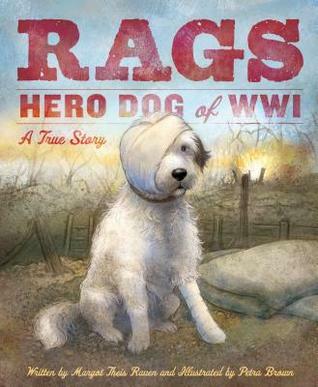 As heartwarming as it is historical, this book tells the story of WWI hero, Rags, a mascot dog. He begins his life as a stray and finds his life's mission when a soldier adopts him from the streets. Through thick and thin they stick together until death does them part. Great read aloud for grades 3-6+ about a bleak war and one of its shining stars. I loved this book and so did all of my students. Very well-written for both read-aloud and silent reading, realistic illustrations, includes additional information about Rags after he retired from active duty as well as facts about service dogs in the military. Great non-fiction read that aligns with CCSS. Highly recommended. This book is on the SC Picture Book Award Nominee list for 2016-2017. It is one of the best stories I have read. It made me cry, but not for the reasons I thought I would. If I could vote, I would vote for this book for the SC Picture Book Award. Dog stories set during a war are always popular. The lifelike illustrations and brave story of faithful Rags will fascinate young readers. The "Tail End" telling the true story of this tale is a plus. Sweet story about Rags, a little stray dog found by a soldier during WWI. Rags becomes a war dog for the United States and helps by carrying messages and boosting morale of soldiers. With the simple story this is a great way to introduce WWI to younger students while sharing a great animal story. Rags, a WWI mascot dog to United States Army soldier, Private James Donovan, will steal your heart. I'm reading Duke by Kirby Larson to my 5th graders now during my fear/courage unit, and this would be a wonderful companion. A beautiful story about a mutt that helps our troops during World War I. THe dog doesn't die in this one...but bring a hankie!